With the Fifa World Cup scheduled to begin on Thursday, all 32 participating countries have released their 23-man squads. Like in 2014, Argentina has the oldest squad, with a median age of 30 years and 3 months (half its players are at least 30 years and 3 months old). They are followed by Panama and Costa Rica with median squad ages of 29 years and 7 months and 29 years and 6 months, respectively.The tournament’s youngest squad is from France, with a median age of 25 years and 2 months, followed by England, with 25 years and 5 months. Interestingly, while the correlation between the average (median) age of the squad and the experience of the squad is positive (figure 1), it is not very strong. In fact, the oldest squad (Argentina) is also the joint least experienced (along with Serbia), with the average player in the squad having represented Argentina in only 10 games. Egyptian captain and goalkeeper Essam Al-Hadary is the tournament’s oldest player, at 45 years. He is also the most experienced player in the tournament, with 157 caps for Egypt (at the time of writing). At the other end of the age spectrum, there are seven 19-year-olds who are in their respective national squads, including French striker Kylian Mbappe and English defender Trent Alexander-Arnold. Interestingly, among the 19-year-olds who will play the tournament, Alexander-Arnold is the only player who is yet to make his international debut. There has long been a theory in elite sport that players born in the early months of the year are more likely to be elite sportsmen. The hypothesis is that age group tournaments usually have a date of birth cutoff of 1st of January, and at an early age, the age advantage that players born in January or February have over those born in November or December of the same calendar year is significant. This advantage results in players born early in the year getting greater attention, leading to a positive feedback loop, thus making them more likely to succeed at the elite level. Looking at the dates of birth of players in the forthcoming World Cup, this hypothesis largely holds true. 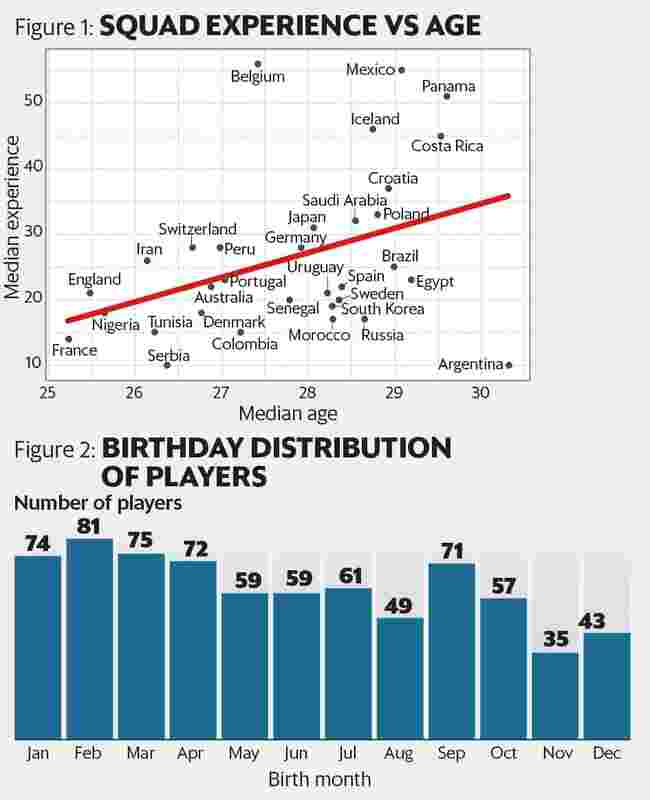 While the relationship is not strict, figure 2 shows us that there is indeed some correlation between the time of year when one is born, and the likelihood of playing at the World Cup. Interestingly, the smoothly downward sloping sequence is broken by spikes in September and October, suggesting that some countries have a different age cutoff. Digging deeper, we find that seven members of the Iranian squad were born in September, indicating a different cutoff there. Similarly, the most common month of birth in the Australian squad is December. The 736 players at the forthcoming world cup play for 311 different clubs. Earlier this year, Manchester City comfortably won the Premier League scoring more than 100 goals and getting 100 league points in the process. The quality of their squad is illustrated by the fact that they are sending 16 players to the World Cup—that is nearly a team and a half! City is followed, not unexpectedly, by Real Madrid and Barcelona, which are sending 15 and 14 players, respectively, to the World Cup. Also sending more than 11 players are Paris Saint-Germain and Tottenham Hotspur. There are four English clubs that are sending 11 or more players to the World Cup, indicating the strength of the Premier League. In fact, all 23 members of the English squad play in the Premier League. Finally, some countries are more dependent on players from a single club compared with others. The good thing about having lots of players from a single club is that having played together through the year, they will be able to gel better at the World Cup. In fact, the erstwhile Soviet Union had a policy of sending the entire squad from the champion club to represent the country. However, dependence on players from a single club indicates that a country’s league is perhaps not competitive. 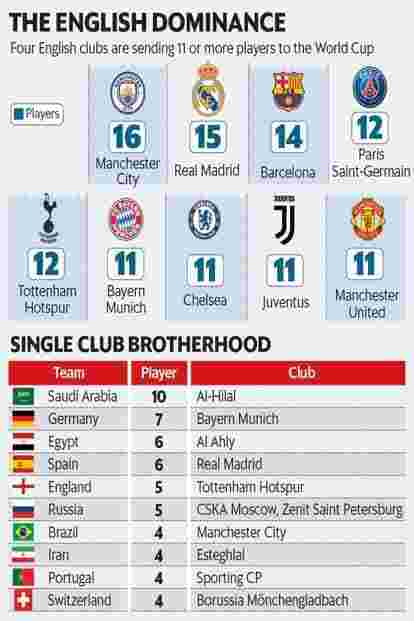 The team most dependent on a single club is Saudi Arabia, 10 of whose players play for Al-Hilal. They are followed by Germany, with seven players from Bayern Munich in their squad. Russia has gone for a split strategy, with five players each from CSKA Moscow and Zenit St Petersburg. Brazil is one of the 10 countries to have four or more players in their squad from a single club. That club happens to be Manchester City!